Nah, the thing he's crying about is probably a celebrity breakup. I was gonna say t&p breaking up, but they've done that before. Widdle cartman is growing up and possibly having feelings for some other individual. If you think about it, cartman's a pretty complex character. Maybe he fell in love with one of his other personalities (like it's be a new one). Who knows, it could happen. nwt000 wrote: This might be (or probably is) analyzing things too deeply, but here is a possible clue to the episode's direction. After all these years, is Cartman really a sweetheart? Probably not. There has to be something shocking in this one as there usually is in each episode. I always look forward to that moment that makes me go 'ahhh! So that's what this is about!' I hope the 'shocker/surprise' is a good one. Like I said, so far there's nothing about this episode that's making me excited except for the fact it's a new episode. Cartman will no doubt blow his first chance at love because he'll be turned off that an opposite race has a liking to him. m1carbine6644 wrote: After all these years, is Cartman really a sweetheart? Probably not. It's either a celebrity crush that will lead to swift disillusionment, or it's bacon. The only relatively important kid they have killed off for good on the show is Pip, who no one really liked anyway. I don't think M&T have plans to kill her off anytime soon, she's their number two girl (after Wendy) these days. Sgt.YatesMonkeyBalls wrote: The only relatively important kid they have killed off for good on the show is Pip, who no one really liked anyway. I don't think M&T have plans to kill her off anytime soon, she's their number two girl (after Wendy) these days. Since Cartman is crying over two people breaking up, maybe he played matchmaker and "finds love" means that he got Token and the new girl to hook up? I guess Trey and Matt really didn't like Pip then. Prior to his death in 201, the little chap had been silent since Season 6. Red, on the other hand, has been used pretty regularly since Season 8. Red has to be somewhat important if she has her own character page. Even though Kevin, Jason, and Dog Poo have their own pages as well, it's not like Annie, Lola, or any of the other girls (besides Wendy and Bebe of course) have their very own pages on here. Finally, Red was a playable character in South Park: Let's Go Tower Defense Play too. I just don't think anyones getting killed this episode, (except maybe Kenny ). M&T have only killed off 3 recurring minor charactors that I can think of, Pip, Chef, and Miss Crabtree. Everyone else has been a one shot charactor. Red use to be call Bertha at first but I think her name got changed to Rebecca during the list. And she's had the nick name Red ever since day one. nwt000 wrote: I guess Trey and Matt really didn't like Pip then. They never liked Charles Dickens, so I always wondered why they even included Pip in the show. Then they made "Pip" aka "Great Expectations" and pretty much killed him off looooong before "201". 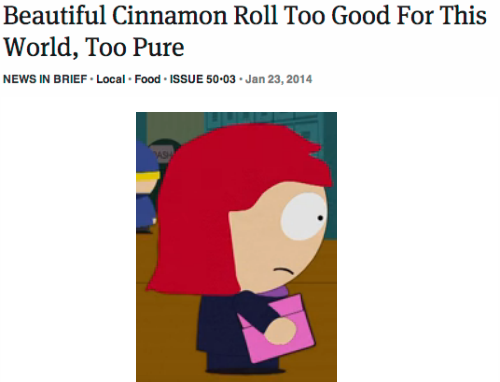 Butters replaced Pip as the gullible character, and I think the show is better for it. I didn't have anything against Pip though. maxbjr wrote: I just don't think anyones getting killed this episode, (except maybe Kenny ). M&T have only killed off 3 recurring minor charactors that I can think of, Pip, Chef, and Miss Crabtree. Everyone else has been a one shot charactor. I would count Choksondik, Ted (the Mayor's aide), Cartman's dolls (namely Clyde Frog), and Mrs. Donovan. Also, Kyle was originally going to be killed off, but then they decided to permanently kill Kenny. While yes, neither happened, it goes to show that they have no problem killing characters. I don't think anyone is ever safe except for Cartman. Not that I think anyone is getting killed off today. nwt000 wrote: I guess Trey and Matt really didn't like Pip then. Prior to his death in 201, the little chap had been silent since Season 6. Red, on the other hand, has been used pretty regularly since Season 8. Red has to be somewhat important if she has her own character page. Even though Kevin, Jason, and Dog Poo have their own pages as well, it's not like Annie, Lola, or any of the other girls (besides Wendy and Bebe of course) have their very own pages on here. Finally, Red was a playable character in South Park: Let's Go Tower Defense Play too. Pip also has his own page and was a playable character in the tower defense game...look how that turned out.